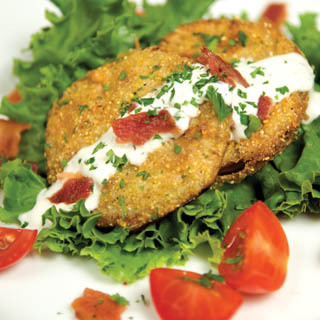 A Southern favorite, cornmeal-crusted fried green tomatoes are perfect for a light lunch or as a side to a home-cooked dinner. Nutrition Highlights: Tomatoes are filled with antioxidants vitamin A and C, and they contain lycopene, a natural phytonutrient that may help reduce risk of prostate cancer. Cut off ends of the tomatoes and slice each tomato into about three 1/2-inch pieces. Put tomato slices in a large bowl. Add buttermilk and turn to coat each slice. Marinate for 5 minutes. Place a large heavy skillet over medium-high heat. Add oil to come two-thirds up the side of the pan, and heat oil to 325 degrees. In a wide bowl, mix cornmeal, salt and pepper. Working in batches, remove tomatoes from buttermilk, shaking off excess and dip in cornmeal to coat each side. Shake off the excess cornmeal. Slip the slices into the oil in a single layer and fry until golden brown – about 2 to 3 minutes on each side. Drain on paper towels. To dress up your dish, drizzle ranch dressing and sprinkle homemade bacon bits on top. Or, add bread for a fried green tomato sandwich. No buttermilk on hand? You can use regular milk as a buttermilk substitute. I love fried green tomatoes, and these look amazing! Thanks for sharing these so I could see them at What’s Cooking Love. I have made a couple of different recipes for these but I haven’t found the one I love yet. This could be the one! I pinned it. I hope you’ll come share it at my weekly party: http://www.tumbleweedcontessa.com/blog/whatd-you-do-this-weekend-18/ Best wishes for tasty dishes this week!